In this section of the site, you will learn about the more common types of orchids, with orchid care instructions so you know how to grow them. The thumbnail pictures will help you know which are interesting to you. Good choices for beginners are indicated by an orange background. About 30,000 species of orchids come from all over the world, on every continent except Antarctica. 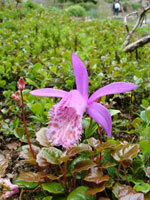 As you can imagine, they come from a wide range of habitats and each type of orchid has different care requirements. Their incredible diversity also means you can always find another interesting orchid type to grow, which is one of the principal reasons the orchid hobby is so addictive! Angraecum, the Comet Orchid, is a genus of monopodial orchids from Africa and Madagascar, with white flowers fragrant at night. 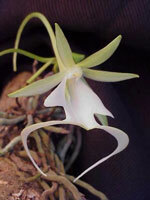 The most famous species is Angraecum sesquipedale, the Christmas Orchid. Anguloa, the Tulip Orchid, is well described by its common name! They have substantial, tulip-shaped flowers in shades of white, green, yellow, and red. They like a lot of humidity, intermediate-to-bright light, and cool-to-intermediate temperatures. They really like humidity and hate drying out during the growing season, but most need a dry rest after flowering. Arundina graminifolia, the Bamboo Orchid, commonly grows as a roadside weed in much of Southeast Asia. 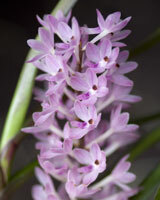 It has attractive pink flowers at the top of large, canelike pseudobulbs. Ascocentrum orchids are beautiful Vanda relatives. They are generally considered miniature orchids, as they look a lot like Vandas, except smaller and brightly colored, with quite dense, erect flower stems. 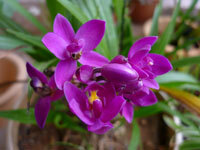 Barkeria orchids are very beautiful plants, most with purple flowers. They should be grown mounted, and are adapted to a long dry season in their native Mexico, during which the leafless plants resemble dead twigs. Bletilla orchids, including Bletilla striata, the Chinese Ground Orchid or Hardy Orchid, are temperate plants that are cold hardy down to USDA Zone 5, if mulched well in the winter. The leaves are attractive even when they aren't blooming. Common colors include white and purple. Brassavola orchids are fragrant relatives of Cattleyas that have terete leaves ("terete" means "tubular") and very showy white lips. They are pretty forgiving of less-than-optimal care, and quickly grow into large specimens. 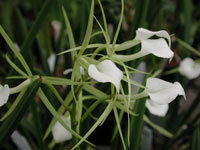 The best-known Brassavola is the Lady-of-the-Night Orchid, Brassavola nodosa. Brassia, the Spider Orchid, has long, narrow tepals to attract spider-hunting wasps. The resulting sprays of flowers have a very dramatic appearance due to the large numbers of tepals pointing everywhere! Brassias are related to Oncidiums, and are often hybridized with them. The Bulbophyllum orchid genus is the largest in the Orchidaceae family, with over 1800 species, making it the third largest genus of plants. (Taxonomists will probably eventually split it into several smaller genera, but with so many types of orchids it's a massive undertaking!) They differ widely in appearance, but all have a single leaf emerging from the top of the pseudobulb, flower stems coming from the bottom of the pseudobulb, and a hinged lip designed to tip insects against the column. Many are pollinated by flies, and stink like dung or rotting carcasses, which is a great conversation starter and gives you bragging rights for putting up with it! (They don't all stink, fortunately.) The rhizomes wander all over the place and often branch freely, so it's easy to grow an impressive specimen. Catasetum orchids, along with the other members of the Catasetum alliance, have big, thick pseudobulbs with an attractive fan of thin leaves along their length. The flowers can be very showy, but are unisexual, so that male and female flowers look different. Lighting affects which kind appears. They need a dry rest after flowering when the leaves drop. Cattleyas were discovered in 1824 when William Cattley received a sickly plant of Cattleya labiata used as packing material in a shipment of orchids and nursed it back to health. When it bloomed, it created quite a stir! 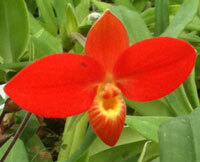 Cattleyas are still among the most popular types of orchids today. The Coelogyne orchid genus gets a lot less attention than it deserves. The plants have beautiful, fragrant flowers, can tolerate drought and neglect, and rapidly develop into massive, impressive specimens. The best-known species come from the foothills of the Himalayas, where the elevation produces cool temperatures. The largest-flowered species in the genus, Coelogyne cristata, is one of these cool-growing types. Coryanthes, the Bucket Orchid, is a Stanhopea relative that has even odder flowers. The lip is modified into a water-filled bucket; bugs fall in, can't fly out, and must crawl past the column to escape. They are fragrant orchids, and must be grown in a basket as the flower stem comes out the bottom of the pot. Cycnoches orchids have unisexual flowers, meaning they have separate male and female flowers which look different (usually just one of the two types of orchid flowers each time it blooms). The flowers are usually make a very dramatic display. After flowering, the leaves drop off and it enters a dry rest; don't water until it starts to grow again or it will rot. Cymbidium orchids are among the showiest types of orchids, with sprays with numerous large, colorful flowers, usually in winter. These plants are quite popular, and some have been cultivated for thousands of years. They need cool temperatures to initiate blooming. 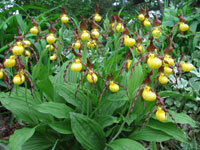 Cypripediums are temperate lady slipper orchids that you can grow in the garden if you live in a temperate climate! They are widespread, so most temperate climates have a species that can do well. You can also grow them in pots, if you want to use the refrigerator to simulate winter. 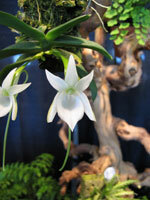 Dendrobium is a large genus, with about 1200 species. They come from many different habitats, so it's necessary to read up on the particular type you intend to grow. They tend to like bright light, but most other care requirements have exceptions. They are one of the most popular types of orchids, and many are quite beautiful. 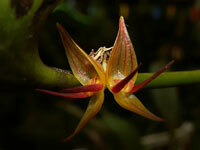 Dendrophylax lindenii, the Ghost Orchid, has truly spectacular flowers but is difficult to care for in cultivation. They do much better in their native habitats in Florida and Cuba, though habitat destruction has endangered the species. These plants lack leaves, and photosynthesize with their roots! Disa is a genus of beautiful plants with rather triangular flowers, often red. They require VERY different care than other types of orchids, so it's easy to kill them if you don't know what you're doing. In particular, they like it wet and should never dry out. The best-known Disa is Disa uniflora, which in South Africa is known as the Pride of Table Mountain. Dracula is a genus closely related to Masdevallia. Their flower stems tend to grow downward, and they have a larger lip that often looks like a mushroom to attract flies. Care is similar to Masdevallia and other cool-growing pleurothallids. 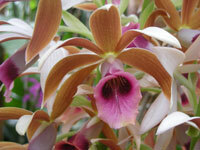 Encyclia orchids are members of the Cattleya alliance. Some species have upside-down flowers. Many are fragrant. In contrast to Cattleya, the pseudobulbs are short and round, and usually have only a minimal bract. Many species have delicate, widely-spaced flowers along the inflorescences. They like similar care to Cattleyas. 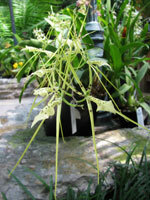 Epidendrum orchids are among the oldest genera in the orchid taxonomy. Originally, this genus included all epiphytic orchids. As knowledge of the different types of orchids expanded, the classification became much more refined; for example, there are now some terrestrial species in the Epidendrum genus, and a great many other species have been moved to other genera. 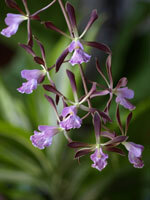 Still, over 1000 Epidendrum species exist. They are usually easy to grow, and most have tall canelike pseudobulbs that lean all over the place and frequently produce keikis. Fun orchids! The Gongora orchid genus is a really neat type of orchids, related to Stanhopea. They have nice, strong fragrances, often of cinnamon, allspice, or nutmeg. The flower stems hang over the pot's edge and the flowers point downwards. They can adapt to a wide variety of lighting conditions and a relatively large temperature range, but like a lot of water. 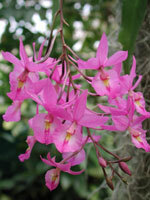 Laelia orchids are relatives of Cattleyas, with brightly-colored flowers in shades of pink and purple; the two genera are often hybridized, and care is similar. 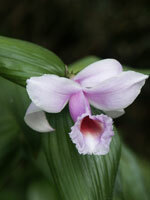 Taxonomists often move species back and forth between the two genera, as well as the currently-defunct genus Sophronitis (which has now been lumped into Cattleya). Ludisia discolor, the Jewel Orchid, has beautiful foliage, usually green striped with red or pink. 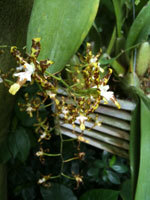 It's one of a few types of orchids grown mostly for its foliage, though the sprays of small white flowers are nice too. There are three different varieties, distinguished by the colors of the leaves. 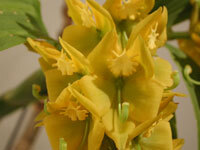 The Lycaste orchid genus, similarly to its relative Anguloa, likes intermediate-to-bright light, intermediate-to-cool temperatures, and high humidity. The flowers look rather different, though; they are more-or-less triangular in shape because the sepals point outward while the petals point forward. 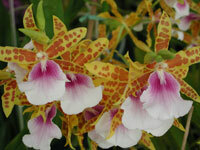 These orchids are very fun to grow, and will thrive if you get their care right. Lady Slipper Orchids is a catch-all term for a few types of orchids, typically referring to any plant in tribe Cypripedioideae, which includes the genera Cypripedium, Paphiopedilum, Phragmipedium, Mexipedium and Selenipedium. 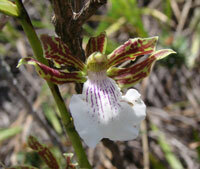 These types of orchids all have a "slipper", a pouch-shaped labellum in which their pollinating insects get stuck. Maxillaria, the Tiger Orchid, is a large genus with over 500 species. They rapidly grow into large specimens. Plants produce numerous, usually small flowers, in amongst the leaves, one to each inflorescence. They are fragrant orchids. Miltonia orchids are members of the Oncidium alliance with large, flat flowers. 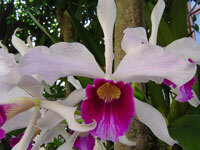 They are often confused with the related Miltoniopsis, or Pansy Orchid. The two genera look somewhat similar, and their names sound alike! Fortunately, care is nearly identical for both groups, so the confusion doesn't cause too many problems. Miltoniopsis, the Pansy Orchid, has flowers that look a lot like a really big pansy, with attractive stripes on the labellum. They are often confused with the related Miltonia orchids; both genera are in the Oncidium alliance, and frequently used in hybridization with the other types of orchids to which they are related. Mormodes orchids are unusual in that their flowers are twisted asymmetrically; the lip typically touches the back of the column! They are fragrant orchids. 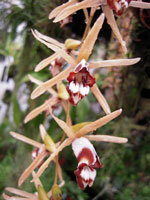 Care is similar to the related Catasetum orchids. The photo at left is of Cycnodes Wine Delight 'JEM' FCC/AOS, a highly-awarded intergeneric hybrid with Cycnoches. Many Oncidiums produce long, branching sprays of hundreds of flowers. They appreciate lots of water, and lots of air to the roots, a somewhat tricky combination! The flowers of some species and hybrids are so numerous that blooming plants are sometimes mistaken for swarms of bees. Paphiopedilums are slipper orchids that come from southeast Asia. Many have attractive, mottled leaves, too! 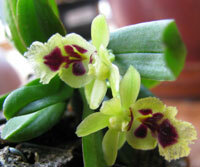 They grow well in relatively low light, which can be convenient for indoor orchid care. 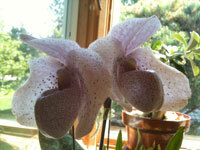 They are quite easy to grow, and are among my favorites; my first orchid was a Paphiopedilum. Phaius, including Phaius tancarvilleae, the Nun Orchid, is a genus of terrestrial orchids. They are quite easy to grow, and have numerous (usually 10-20 per stem) large and showy flowers, with tube-like labellums. Phalaenopsis, the Moth Orchid, is one of the most commonly available and easiest to grow orchid genera. 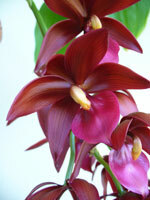 It is an especially good choice for beginners to orchid growing. They have large, showy flowers that come in a wide variety of colors. Most species have several flowers per stem, but some have more, and others have as few as one or two. There are a great many hybrid varieties on the market. 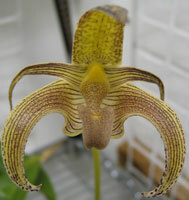 Phragmipediums are slipper orchids that come from South and Central America, and tend to like it wet! They have very colorful flowers, particularly the red species such as Phragmipedium besseae, which may be my favorite orchid. A recent discovery, Phragmipedium kovachii, promises to revolutionize Phragmipedium breeding. Pleione, the Peacock Orchid, is a temperate orchid hardy down to freezing, and often sold as a "bulb". If you don't live in a suitable climate, you can simulate its winter with the refrigerator. They're very pretty, so I suggest trying them out! Pleurothallis orchids are a huge genus, with several hundred types of orchids, mostly native to cloud forests in the Andes. They like high humidity, cool temperatures, and hate to dry out. Most are tiny orchids, so you can have a large collection with many types of orchids in a small space! 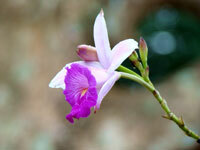 The Sobralia orchid genus grows ubiquitously in much of South and Central America; I've heard them called "ditchweed"! 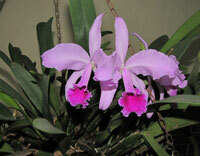 They have beautiful, short-lived flowers whose appearance is somewhat similar to a large Cattleya orchid. Flowers can be more than 6 inches (15cm) across in some species. The plants can get quite large, however, so you need to have enough space for them! Stanhopeas are fragrant orchids pollinated by male bees that collect their fragrance to attract females. They have very complex, beautiful flowers... that grow out the bottom of the pot! So they are usually grown in a basket to allow the flower stem to escape. Spathoglottis, including the Ground Orchid, Spathoglottis plicata, are terrestrial orchids with showy, often purple, flowers. 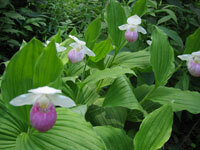 They are often included in flower gardens in areas where temperatures stay above freezing. Vandas are beautiful orchids that like lots of light and warm temperatures. They tend to have large, round flowers. 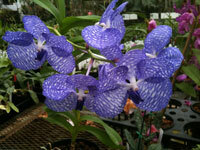 Most other types of orchids in the Vanda alliance like similar care. 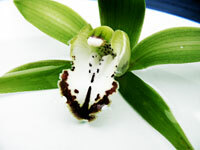 Yes, Vanilla is an orchid! 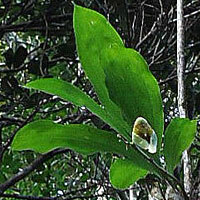 Actually, it's a whole genus of orchids, but Vanilla planifolia is the one the vanilla bean comes from. (It's actually the plant's seed pod.) 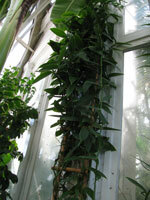 They are a very unusual type of orchids because they grow as a vine. Also, they are notoriously fragrant orchids. The Zygopetalum orchid genus is unusual in having its tepals fused at the base, so that sepals fuse to the adjacent petals. The fowers are quite showy, and they are very easy to grow.